Born in 1959, Jive grew up in Lancaster, Missouri. He started flying lessons when he was 15, soloed on his 16th birthday and received his private pilot’s license on his 17th birthday, the earliest age allowed. By the time Jive received his BS in Aviation from Northeast Louisiana University (now University of LA-Monroe) and was entering the United States Air Force’s Officer Training School in 1983, he had already earned his Airline Transport Pilot (ATP) License and had logged approximately 4300 flight hours. Kerby retired from the USAF in 2006 after 23 years of service. 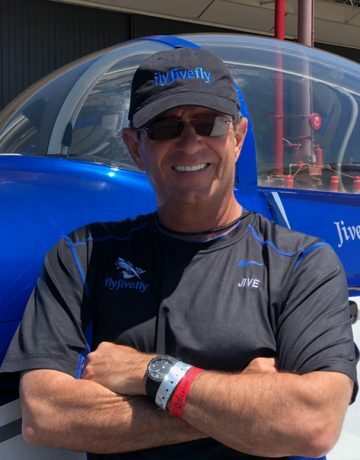 Currently, Jive is the Vice-President of Operations for Draken International, Inc., a Department of Defense Contractor headquartered in Lakeland, Florida with a detachment squadron based at Nellis AFB, Las Vegas, Nevada. He also flies as an Aggressor Pilot for the company helping to train both US military fighter pilots and those from US ally countries. In May of 2013, Jive took his first tandem skydive, and he decided to begin training as soon as possible. His first solo jump to begin AFF training was on January 25, 2015, and he completed the training on March 28, 2015. He will soon have over 100 jumps. Copyright © 2018 Jump Pilot Academy℠ Las Vegas.